Thanks to a surprisingly underperforming animated comedy (The Emoji Movie) and R-rated action-thriller (Atomic Blonde), box office champ Dunkirk managed to take its second frame in a row last weekend, dropping just 47.3% to take the top spot with $26.6 million. 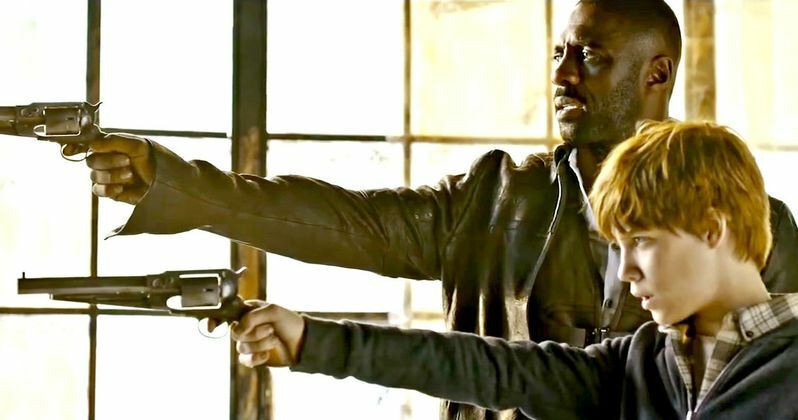 However, there won't likely be a three-peat for this WWII thriller, since it goes up against a movie Stephen King fans have been waiting years to see, The Dark Tower, which will go up against new distributor Aviron's Kidnap, which had acquired the thriller from Relativity Media, and Annapurna's Detroit, expanding nationwide after a limited release debut last weekend. We're projecting that The Dark Tower will open with $38.6 million, which may not be much, but will be more than enough to take the top spot. Many fans were shocked when the Dark Tower runtime was revealed to be just 95 minutes long, since the Stephen King books this franchise-to-be is based on are quite long. Still, this shorter runtime, and smaller budget, which is reportedly $60 million could be beneficial to The Dark Tower's box office in the long run, for a couple of reasons. For one, a 95-minute runtime could be more enticing for repeat viewings in theaters, as opposed to returning to the theater for a two and a half hour movie like many of this summer's franchise tentpoles. Also, there is significantly less pressure for this movie to be a global blockbuster, which is good since it won't be opening in the second largest market in the world, China, at least not right away, as the country imposes a "Hollywood blackout" during the country's summer school break. Box Office Mojo reports The Dark Tower will open in 3,200 theaters this weekend, which is much less than the 4,000-plus screens many summer tentpoles open at, with Detroit expanding to 2,800 theaters and Kidnap arriving in 2,200 theaters. Sony and Media Rights Capital (MRC) are also planning a Dark Tower TV series, with writer-producer Akiva Goldsman confirming last month that Idris Elba will in fact return as Roland Deschain, a.k.a. The Gunslinger, in this series. It is believed that the series will air in between the movie trilogy, although there haven't been any concrete announcements as to when production may begin, or when and where the series may air. It's possible that The Dark Tower runtime is so short because of this sprawling plan to spread the story out over multiple mediums, but the success of this plan surely depends on The Dark Tower becoming a hit at the box office first. If it does hit or exceed this $38.6 million opening weekend projection, it will certainly be on its way to a profitable release. The Dark Tower book series tells the story of Roland Deschain, Mid-World's last gunslinger, who is traveling southeast across Mid-World's post-apocalyptic landscape, searching for the powerful but elusive magical edifice known as The Dark Tower. Located in the fey region of End-World, amid a sea of singing red roses, the Dark Tower is the nexus point of the time-space continuum. It is the heart of all worlds, but it is also under threat. Someone, or something, is using the evil technology of the Great Old Ones to destroy it. Matthew McConaughey stars as the man trying to stop Roland Deschain, The Man in Black, who will stop at nothing to destroy The Dark Tower. We're predicting that Dunkirk drops to second place with $18.4 million, followed by the impressive Girls Trip, which keeps holding quite well, in third place with $12.6 million, The Emoji Movie in fourth place with $11.6 million and Kidnap rounding out the top 5 with $10.5 million. Kidnap was previously set up at the cash-strapped Relativity Pictures but it was acquired by the upstart company Aviron as its first release. The story centers on single mom Karla Dyson (Academy Award winner Halle Berry), whose life turns upside down when her son suddenly disappears. Without a cell phone and knowing she has no time to wait for police help, Karla jumps in her own car and sets off in pursuit of the kidnappers. A relentless, edge-of-your seat chase ensues, where Karla must risk everything to not lose sight of her son. In this tense, action-fueled thriller, directed by Luis Prieto and from the producers of Salt and Transformers, one mother's heroic attempt to take back her son leads her to ask herself how far she will go to save her child. The top 10 will be rounded out by the expanding Detroit ($10.1 million), Atomic Blonde ($9.8 million), Spider-Man: Homecoming ($7.1 million), War for the Planet of the Apes ($6.3 million) and Valerian and the City of a Thousand Planets ($4.2 million). Detroit opened in impressive fashion last weekend, earning $365,455 from 20 theaters for a $18,273 per-screen average, before its nationwide expansion this weekend. Also opening in limited release is the independent drama Columbus, Arrow Films' thriller The Ghoul, Yash Raj's romantic comedy Jab Harry Met Sejal, Parade Deck Films' sci-fi horror film Lycan, Good Deed's comedy Some Freaks, Fox Searchlight's documentary Step and The Weinstein Company's drama Wind River. Looking ahead to next weekend, New Line will roll out its latest Conjuring spin-off Annabelle: Creation, alongside Lionsgate's The Glass Castle and The Nut Job 2: Nutty by Nature. Also opening in limited release is A24's Good Time, Freestyle Releasing's Bedeviled, Neon's Ingrid Goes West, Strand's The Nile Hilton Incident, Well Go USA's Once Upon a Time and A Taxi Driver, Roadside Attractions' The Only Boy Living in New York, IFC's A Trip to Spain and Magnolia's Whose Streets. Take a look at the top 10 projections for the weekend of August 4, and check back Sunday for the top 10 estimates.